In London, a young homeless tomcat was injured by a dog. In pain, thin, hungry, and cold, he lay down in the shelter of an apartment hallway. For days he lay, until a lonely young street musician named James took him in and named him Bob. Now Bob is a very intelligent cat who does very uncatlike things. He formed a very close bond with James, a recovering drug addict struggling to get his life back on track, and opened his heart. He would ride on James's shoulder, take the bus, and spend five hours a day lying patiently in a guitar case while James played for tips. Then, they would buy some supper, sit on the sofa, and watch telly together in the evenings. 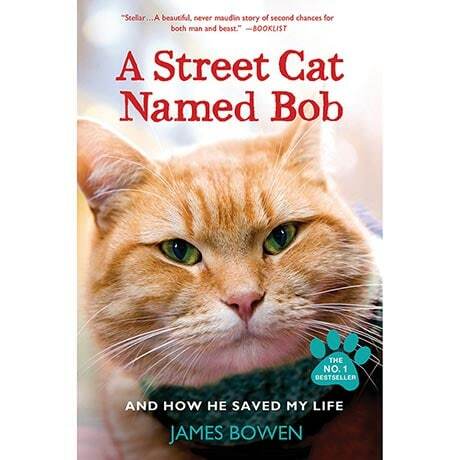 A Street Cat Named Bob (and the compelling sequel: The World According to Bob) are true stories that will touch your heart. And in the latest Bob book, A Gift from Bob, James recounts a particularly bleak and challenging holiday season, and how Bob helped him cope and revealed the true meaning of Christmas along the way.